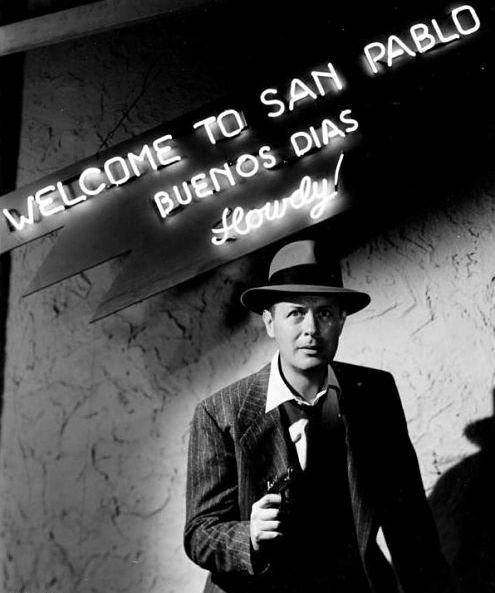 Kiss of Death is director Henry Hathaway’s greatest film noir. 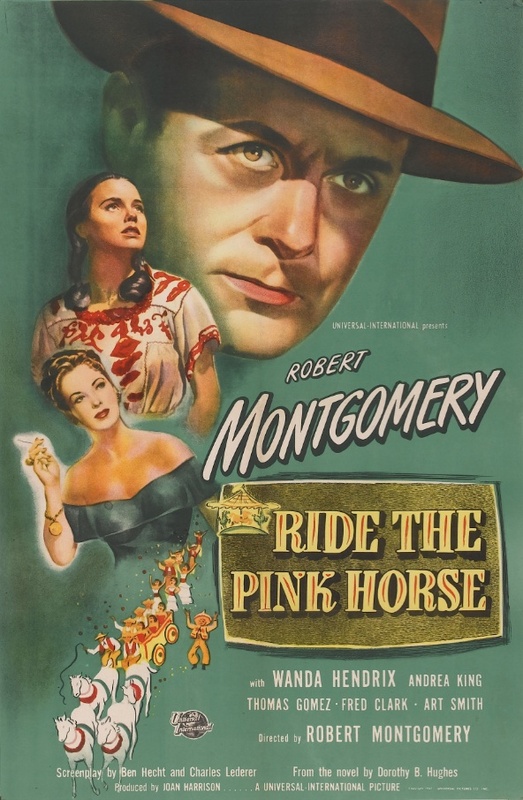 It’s a mix of the semi-documentary style of his earlier films The House on 92nd Street (1945) and 13 Rue Madeleine (1947) with the hard-boiled conventions of his private eye flick The Dark Corner (1946). Unlike The House on 92nd Street and 13 Rue Madeleine, however, this commitment to veracity isn’t in service of a true-ish retelling of World War II-era espionage, but of a hard-boiled crime drama about a three-time loser facing 15 years in stir after being nabbed for a jewel robbery. His name is Nick Bianco (Victor Mature), and if he wants to watch his two little girls grow up, he’s going to have to stool for the district attorney’s office. Bianco has been in this position before, and he took the full four-year rap instead of squealing. “I’m the same guy now I was then. Nothin’ has changed. Nothin’,” he tells Assistant District Attorney Louis D’Angelo (Brian Donlevy). On his way up the river to Sing Sing, Nick meets a cackling, sociopathic hood named Tommy Udo (Richard Widmark). Udo won’t show up again for awhile, but he’ll play a major role in Nick’s life when he does. Nick trusts Assistant D.A. D’Angelo enough to tumble to a job in his past that he got away with — the Thompson Fur Company heist — to provide a cover for his trips to the D.A.’s office. D’Angelo promises that he’ll drop the charges later for insufficient evidence. Things are looking up for Nick. He’s able to care for his daughters, and he’s eventually paroled, leaving him free to marry Nettie. But as soon as Tommy Udo — Nick’s old pal from the trip up to Sing Sing — re-enters his life, things go very bad very quickly. 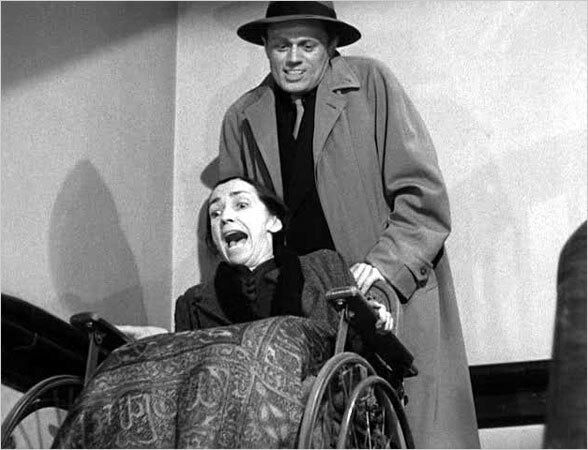 Udo is the kind of guy who thinks nothing of wrapping up an older wheelchair-bound woman (played by Mildred Dunnock) in electrical cord and pushing her down a long flight of stairs, in one of the most enduring scenes of cinematic sociopathy. 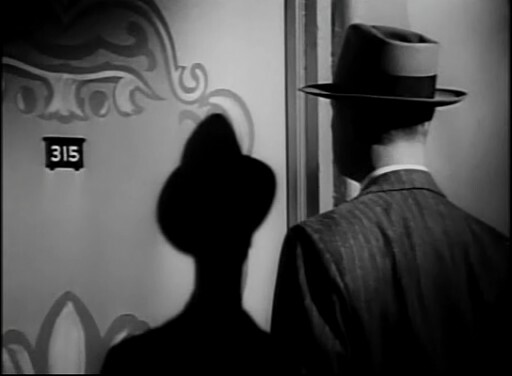 Kiss of Death was Richard Widmark’s film debut, and his balls-out crazy performance is something to behold. The filmmakers thought that Widmark’s high forehead made him look too intelligent, so they outfitted him with a low-browed hairpiece. Like Heath Ledger’s performance as the Joker in The Dark Knight (2008), Widmark’s performance as Tommy Udo straddles the line between gangster movie and monster movie. Director Hathaway had toyed with the idea of casting the manic Harry “The Hipster” Gibson, who sang the 1944 druggie classic “Who Put the Benzedrine in Mrs. Murphy’s Ovaltine?” as Udo, but it’s impossible now to imagine anyone but Widmark in the role. The screenplay for Kiss of Death was adapted by Ben Hecht and Charles Lederer from a story by Eleazar Lipsky originally called “Stoolpigeon.” Lipsky was a novelist who worked as a Manhattan assistant district attorney. He was also legal counsel for the Mystery Writers of America. Perhaps because of Lipsky’s day job, the realism of the setting of Kiss of Death is matched by the actions of its characters. Brian Donlevy, in the role of Assistant D.A. D’Angelo, is neither a hero nor a villain. When he tells Nick that he’s going to have to testify in court after all, and later that it was all for nothing, and that Tommy Udo was acquitted and is probably coming after Nick, the viewer gets the sense that D’Angelo genuinely cares for Nick, but that at the same time, putting Nick’s life in danger is just part of the job. D’Angelo might not like it, but he accepts it as a necessary evil. 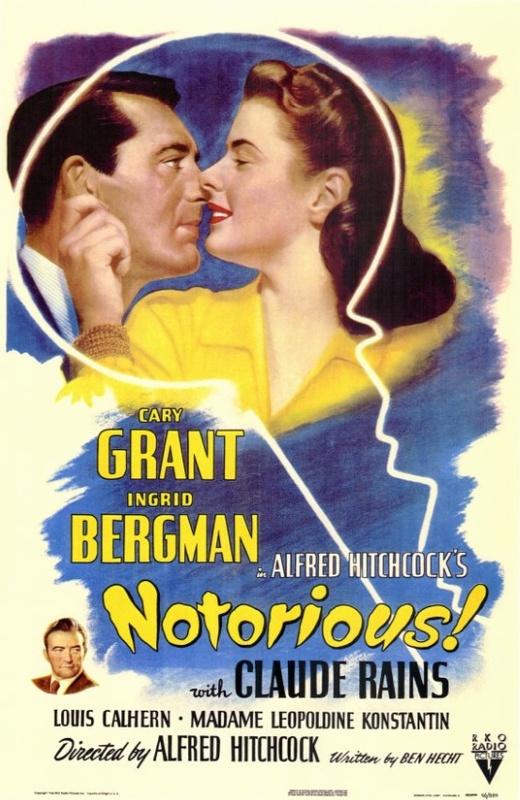 Posted in 1947, August 1947 and tagged 20th Century-Fox, Ben Hecht, Brian Donlevy, Coleen Gray, Eleazar Lipsky, Film Noir, Henry Hathaway, Norbert Brodine, Richard Widmark, Victor Mature. Bookmark the permalink. 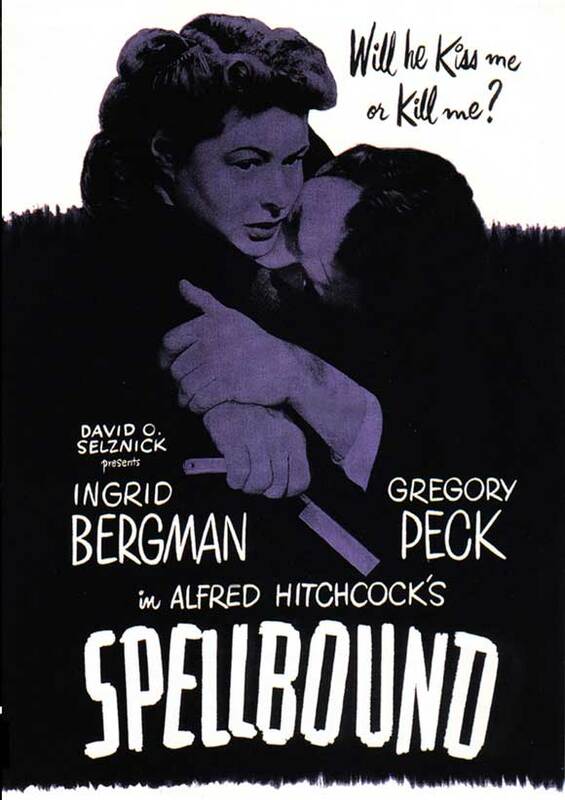 Alfred Hitchcock’s Spellbound gets knocked around for its basis in Freudian theory. Many reviews of the film written in the past 20 years use words like “dated,” “implausible,” and “preposterous.” A lot of these same reviews also praise the dream sequence, which was designed by Salvador Dalí, as the most memorable part of the film. Freud has been knocked around, criticized, and discredited since the turn of the century, so to dismiss a film’s plot and ideas merely because they are “Freudian” seems like picking low-hanging fruit. Granted, Freud had a lot of wild ideas, but he was a brilliant thinker, and should be viewed as a philosopher and a humanist as much as a doctor or scientist. Also, many people who dismiss Freud out of hand haven’t actually read any of his writing, and cannot discuss his ideas beyond the fact that they’ve heard that they’re loony. Upon revisiting the film, I found the much-praised dream sequence by Dalí overly gimmicky, adding little to the narrative beyond a “gee whiz” moment. (Hitchcock had almost nothing to do with its production. Dalí worked with a production unit from the Poverty Row studio Monogram Pictures on the sequence.) There’s nothing wrong with “gee whiz” moments, but Spellbound is an underappreciated film in Hitchcock’s oeuvre, and it bears rewatching as a complete work of art, not just as a showcase for pop surrealism or “dated” notions of neuroses and the unconscious. 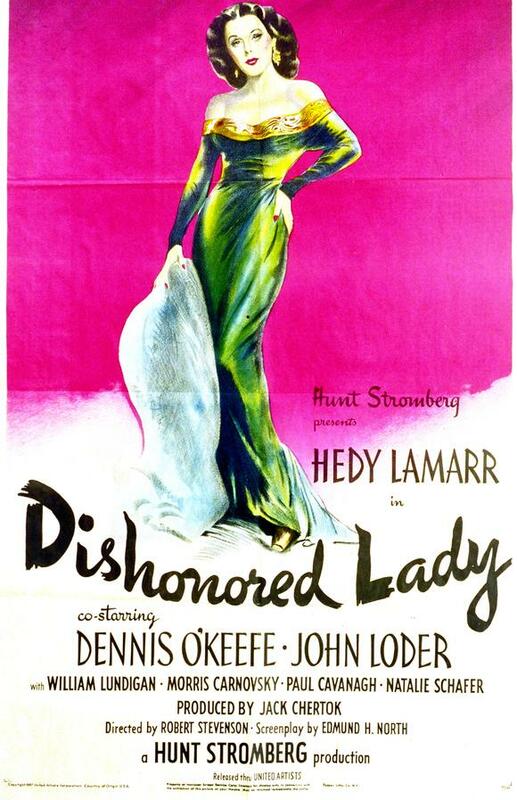 In 1942, after winning back-to-back Academy Awards for best picture (then called “outstanding production”) for Victor Fleming’s Gone With the Wind (1939) and Alfred Hitchcock’s Rebecca (1940), producer David O. Selznick was morose. He took time off and sought treatment. His experience with the “talking cure” was so positive that he decided to produce a picture with psychoanalysis as its subject. In 1943, Hitchcock mentioned to Selznick that he owned the screen rights to the 1927 novel The House of Dr. Edwardes, written by Hilary St. George Saunders and John Palmer under the pseudonym “Francis Beeding.” The Gothic potboiler was about a homicidal lunatic who kidnaps a doctor named Murchison and impersonates him, taking over his position as head of a mental institution. A female doctor named Constance Sedgwick uncovers the impostor’s ruse and eventually marries the real Dr. Murchison. In early 1944, Hitchcock and his friend Angus MacPhail crafted a preliminary screenplay in which Dr. Murchison was the outgoing head of the institution and Dr. Edwardes was his successor. They also created a romance between Constance and Dr. Edwardes, as well as the downhill skiing set piece that cures Edwardes of his amnesia. 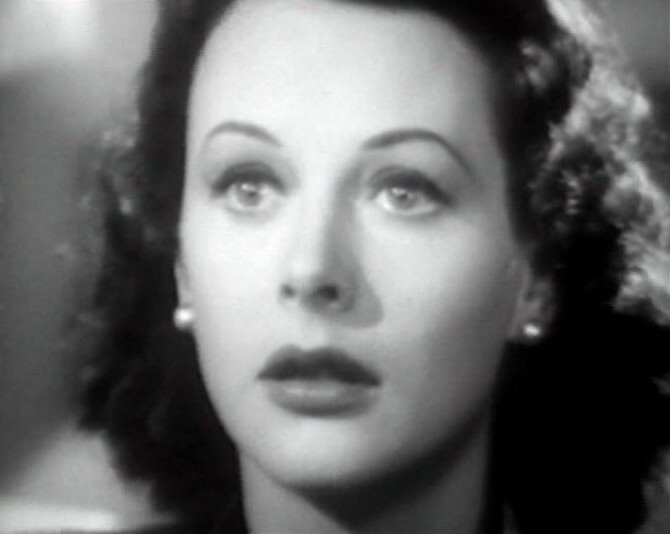 In March 1944, Selznick offered Hitchcock the talents of Ben Hecht, and Hitchcock and Hecht worked together for months to refine the screenplay. They even visited mental institutions, and preliminary versions of Spellbound featured more semi-documentary material than the final product does. 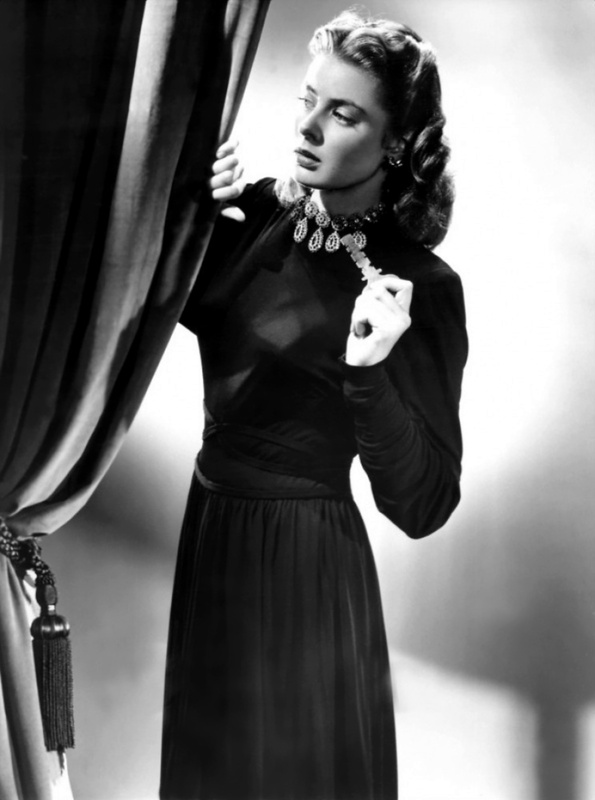 In Spellbound, Ingrid Bergman plays Dr. Constance Petersen, a psychoanalyst at Green Manors, a Vermont mental hospital. Dr. Murchison (Leo G. Carroll), the director of Green Manors, is being forced into retirement shortly after returning to work following a nervous breakdown. His replacement is the young, handsome Dr. Anthony Edwardes (Gregory Peck). “My age hasn’t caught up with me,” Dr. Edwardes responds when someone mentions how young he appears. But this isn’t the case, of course. He is actually an amnesiac who has no idea who he is or how he arrived at Green Manors. His state of confusion is such that he initially believed he was Dr. Edwardes, and is now playing the role because he doesn’t know what else to do. Dr. Petersen uncovers the truth, but she has already fallen instantly, madly in love with him. When the rest of the world learns the truth about Dr. Edwardes, he flees Green Manors. He still has amnesia, but he knows that his real initials are “J.B.” He heads for New York, and tells Dr. Petersen not to follow him. Does she follow his advice? Of course she doesn’t. The romance is a high point of the film. The presentation of Dr. Petersen’s initial “frigidity” is certainly dated, but it leads to one of Hitchcock’s wildest sequences. When Bergman first kisses Peck, a shot of her forehead dissolves into a shot of a door. The door opens, revealing another door, which also opens, revealing another door, and so on. Bergman’s performance is pitch perfect in every scene. 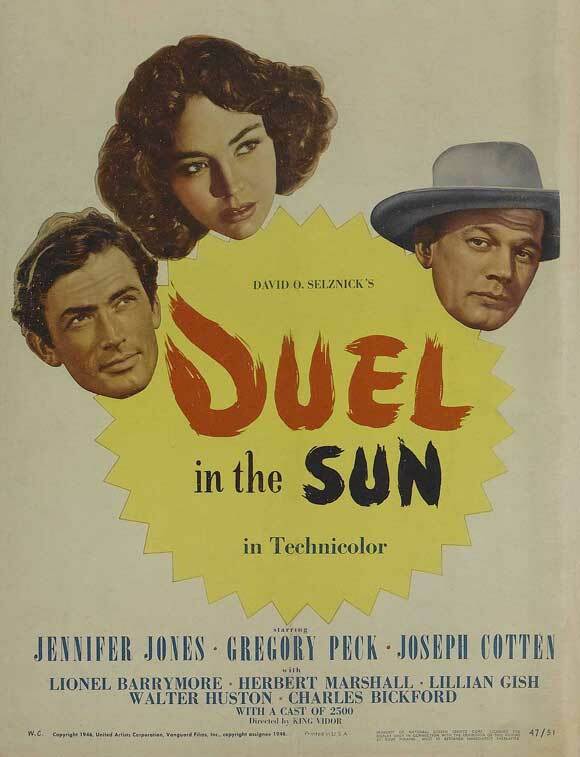 Peck’s performance is less natural, but it works, since he is playing a man who literally doesn’t know who he is. (Apparently Peck craved more direction from Hitchcock, but Hitchcock just kept telling him things like “drain your face of all emotion.” Hitchcock had little patience for method acting.) Also, you would be hard-pressed to find two actors in 1945 who were more physically attractive than Bergman or Peck. 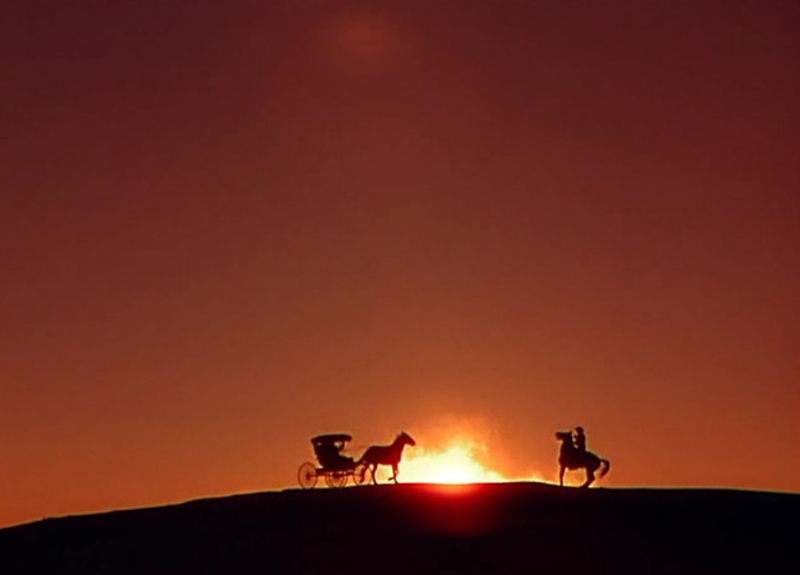 The cinematography by George Barnes is another high point. Each shot in Spellbound is beautifully constructed, and gives off a silvery glow. There are a number of choices that are still shocking, such as a flashback to an accidental death, or the penultimate sequence in the film, in which a P.O.V. shot shows a revolver being turned directly on the audience. 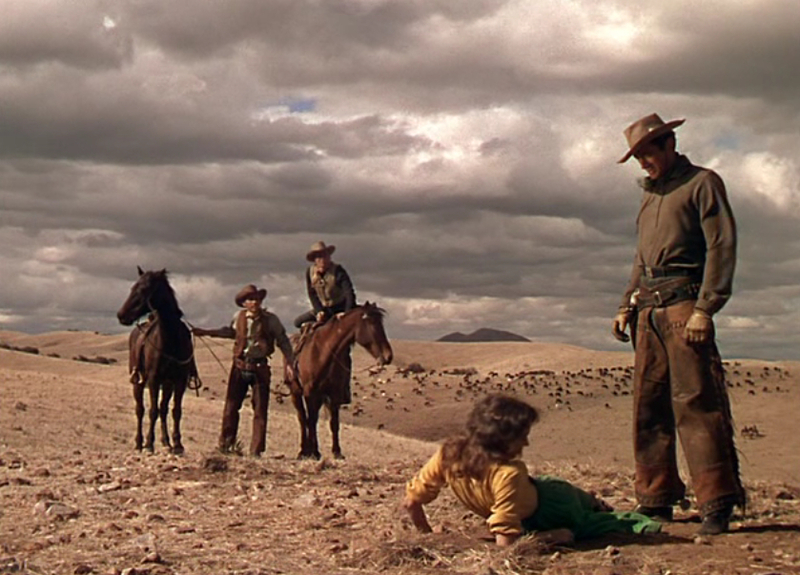 When the trigger is pulled, there is a splash of red, the only instance of color in the film. It’s an assault on the audience par excellence from a man who spent his entire career assaulting his audience while almost never alienating them, which is not an easy thing to do. Miklós Rózsa’s score for the film incorporates a haunting theremin melody, as did his score for The Lost Weekend, released around the same time. Rózsa won an Academy Award for best score for his work on Spellbound. 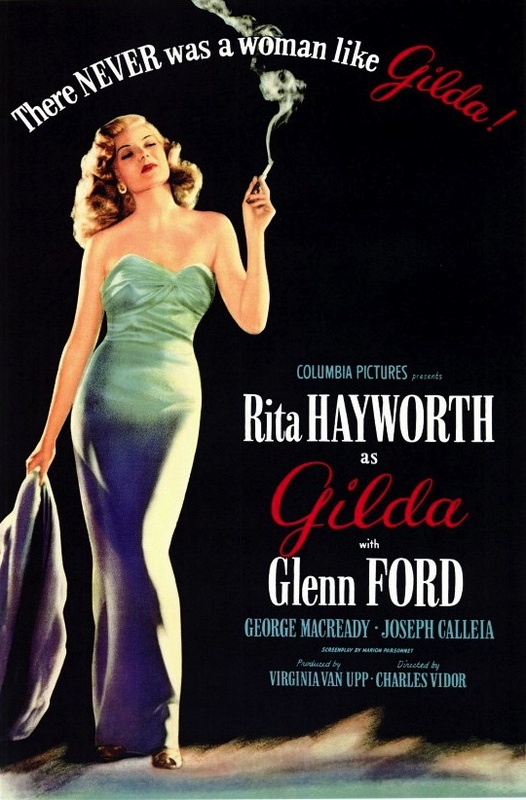 Hitchcock was disappointed in the music, however, since it emphasized the romantic aspects of the film, and was more to Selznick’s liking than his own. Sometimes creative dissonance leads to great creations, however. Spellbound is a great movie, whether or not its producer and director ever saw eye to eye. Posted in 1945, December 1945 and tagged 18th Academy Awards, Alfred Hitchcock, Angus MacPhail, Art Baker, Ben Hecht, Bill Goodwin, David O. Selznick, Donald Curtis, Francis Beeding, George Barnes, Gregory Peck, Hal C. Kern, Hilary St. George Saunders, Ingrid Bergman, James Basevi, John Emery, John Palmer, Leo G. Carroll, May E. Romm, Michael Chekhov, Miklós Rózsa, Mystery, Norman Lloyd, Paul Harvey, Regis Toomey, Rhonda Fleming, Romance, Salvador Dalí, Spellbound, Stephen Geray, United Artists, Wallace Ford, William H. Ziegler. Bookmark the permalink.